Golf Australia (GA) is calling for expressions of interest from women within the golfing community or those considering golf who would like to share their experiences in golf. GA is a participant in the Male Champions of Change (Sport) program (MCCS). 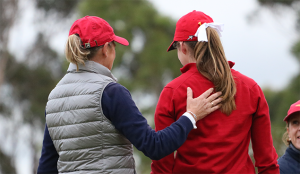 Our MCCS participation forms part of our commitment to our Vision 2025 women and girls strategy that aims to increase the engagement of women and girls in golf. Members and sports within the MCCS group have committed to conducting focus groups within their sports as part of the listening and learning process. To do this GA is encouraged to facilitate safe, supportive and welcoming spaces that invite women in to share their experiences within golf. The confidential insights from the focus groups will inform discussions at a later MCCS session and will play an important role in our in the development of our Vision 2025 actions. Once expressions of interest have been received, GA will invite a diverse group women from across our golf community to attend a Listen & Learn session. To thank you for your time, all participants will receive 2 Big Swing indoor golf simulator vouchers courtesy of Drummond Golf (valued at $30 each). If you have any questions, please do not hesitate to contact Chyloe Kurdas, National Female Participation Manager, Golf Australia – ChyloeK@golf.org.au.